A closer look at the thick, vault door which had courthouse employees talking on Thursday. 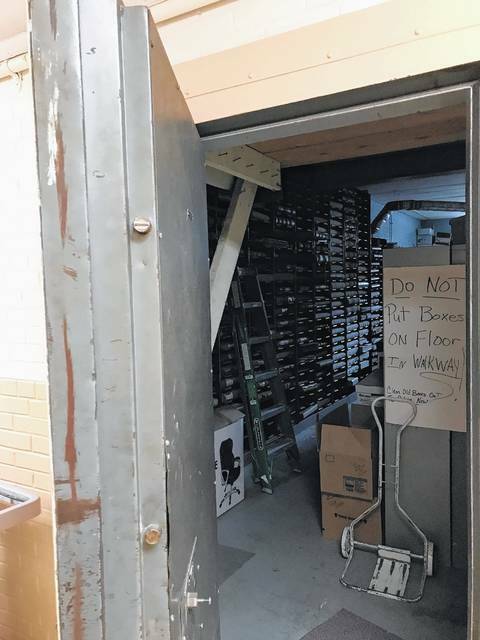 This vault door located on the first floor of the Mason County Courthouse seemed to open by itself early Thursday morning as caught on a security camera. POINT PLEASANT — When employees of the Mason County Courthouse arrived to work Thursday morning, they noticed something different. The door to the vault on the first floor was wide open. The vault holds records from the County Clerk’s office and the County Commission, some of these records going back years. Though the door wasn’t locked, it was pushed closed when the building was locked the night before. Curious as to who got into the vault, and if anything was missing, the security film was reviewed. Though no culprit was revealed, it was more about what was “unseen” that has people talking in the courthouse. At 3:17 a.m., Thursday, the security camera in the first floor hallway kicks on, as it’s supposed to do when motion in the area is detected. What it captures is the vault door slowly opening on its own and coming to a stop in the hallway with no one to be seen. 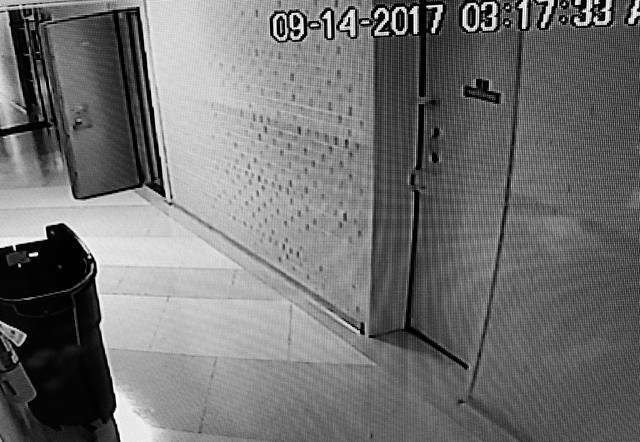 The data from the security camera in the hallway, shows it continuously detected motion throughout the rest of the night in the hallway, though no person or object could be spotted. When the cameras detect motion, they kick on and when nothing is found, automatically shut down after a short time. There’s a theory that a build up of air in the vault room pushed the door open. However, the vault door is thick and heavy and it isn’t easily opened, though once pushed, gravity takes over and the door swings open. On Friday, the Point Pleasant Register spoke with five courthouse employees who work in different parts of the building, though all had some consistent stories to tell about things they can’t explain. Consistencies in the stories, included hearing footsteps in the hallways when no one can be seen or at times when no one is supposed to be in the building. Then there are unexplained slamming doors. There’s also an elevator just off of the Family Court offices that tends to travel between the floors when no one is on it. Also, on this elevator is a call box in case someone gets stuck on the elevator. Employees report hearing what they describe as a telephone ringing in the box – in fact it used to contain a telephone and if the elevator were to get stuck, a call for help would ring into Mason County 911. Employees report hearing a woman’s recorded voice similar to one from a telephone company, stating, “if you’d like to place a call, please hang up…” Then there is at least one desk drawer that likes to pull out on its own at a desk of one employee on the second floor. Family Court is now housed where a portion of the old jail used to be. There were also holding cells in the basement and cells on the third floor. Though the current courthouse isn’t that old, having been built in 1956, it has seen its share of tragedy. In 1976, five people were killed as a result of an explosion in the jail, including Sheriff Elvin “Pete” Wedge, Deputy Kenneth Love and Jailer Ernest Hesson, as well as a prisoner and the prisoner’s husband who reportedly fired a shotgun into explosives he carried into the building. Love, the prisoner and her husband were killed instantly, while Wedge and Hesson succumbed to their injuries a short time later. The jail was rebuilt in the same spot but over the years, the use of that space was modified now that Mason County houses all prisoners at the Western Regional Jail. Long before that, the remains of Chief Cornstalk, the Shawnee chief who was murdered, were buried on the grounds of the Mason County Courthouse. When the old courthouse was razed to erect a new one in its place in 1954, it was decided to move the grave to Tu-Endie-Wei State Park. The courthouse also sits on the corner of 6th Street and witnessed the collapse of the Silver Bridge in 1967, which connected 6th and Main Street with Kanauga, Ohio in Gallia County, Ohio. There is little doubt the courthouse has seen its fair share of history, tragedy and life. One of the courthouse employees said sometimes when she’d work during hours when the building was supposed to be closed, she had caught figures out of the corner of her eye, like someone passing by an open doorway but upon inspection, no one was there. Though disconcerting, she didn’t feel there was any harm from whatever had passed by and these “strangers things” are just something several in the courthouse say they’ve gotten used to over time.